I might have mentioned it before, my mother got married very young and had me when she was barely 18. It meant, I have remotest memories of her 20s but 30s is clear as yesterday. I remember her favourite cobalt blue salwar kameez, the duppata falling perfectly on her slender shoulders, the chiffon sleeves loosely wrapped unto the elbow. Her skin, always complimented as porcelain like, was exactly that but I often marvelled at her rosy lips, one she would intensify with a rosy pink lipstick, the only colour she ever wore. Her gold kissed brown hair tied into a simple pony gave more reasons to focus on her face. A beautiful young woman, who only cooked good food, made sure we had a freshly made juices after school, evening snack before dinner and fruits as after dinner dessert. She cooks much simpler now and would take a chance of not cooking in a pulse. Her hair has started to grey, often tied in a bun and covered with a head scarf. Instead of finding her in the kitchen preparing our next meal enthusiastically, I find her sitting in the veranda endlessly knitting Bohra cap. She is still pretty young actually, but the little signs of ageing are more severe in my mind than to my younger sisters. 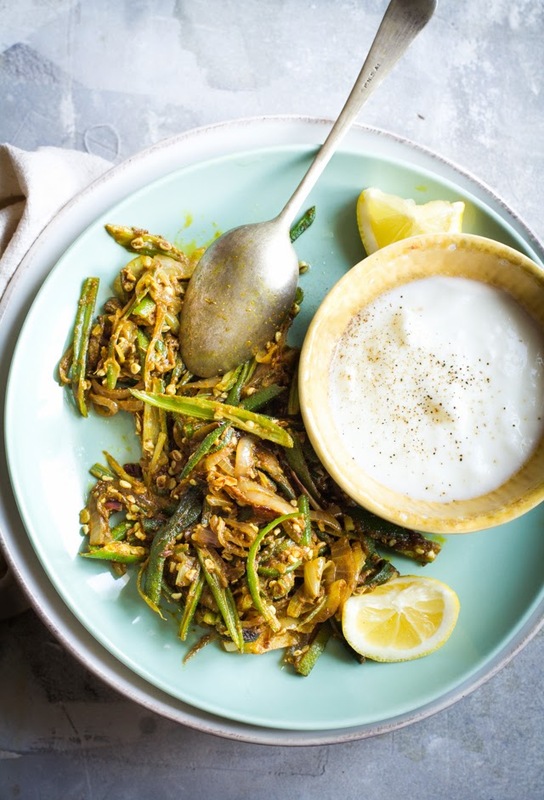 Among the simpler foods that continue to be a staple at Ammi's is okra and onions stir fry. Okra is such a fabulous vegetable, it is sad it doesn't get much attention having often being labelled as slimy. I on the other hand grew up loving okra even through my picky eating years. When cooked right, okra is not really slimy and has a grassy flavour, almost like asparagus but more robust. In this recipe cutting them lengthwise is necessary so that the spices are well coated and reach the internal ribbings. Though I have to admit on occasion I just go about cutting them into disc, add a few tomatoes and call it a okra curry instead! The end result of any okra dish is highly depend on the freshness of okra and having good tender ones as opposed to fibrous and tough pods. Good okra should be green, unblemished and the ends should snap crisply. Ammi has a firm belief that okra cooked in cast iron wok is the best and that's how I cook mine. 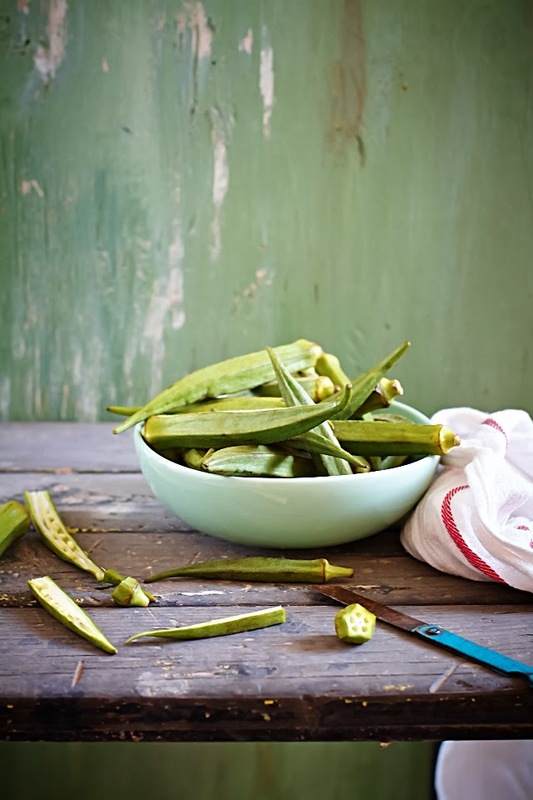 Another important tip is to wash and wipe your okra totally dry before cutting into it. Any moisture will make them gooey and mushy. On a different note, this heart warming post by my friend Shayma was an inspiration for this post. Also, talking about writing, this new to me blog has some great posts. What are your favourite writing blogs? Wash and dry the okra by wiping it with a dry cloth. Cut of the head and tail of the okra and slice it through the centre. Cut thin strips lengthwise from each half . Heat oil in a wok and add all the ingredients except lemon juice. Mix well and let it cook until the okra is cooked through. Sprinkle with lemon juice or mango order towards the end before serving. Serve with a flatbread like roti or pita bread as I did. A simple raita or plain yogurt is a great compliment. That looks so good! An original stir-fry. I can eat bhindi every single day!! sounds insane but true!! Great pics! I LOVE okra! so beautifully captured! This is one of my favorite curries. I grew up eating and loving okras too. I do not mind even the sliminess. You are right, okras cooked right should not be very slimy. Loved reading the description about your mother. 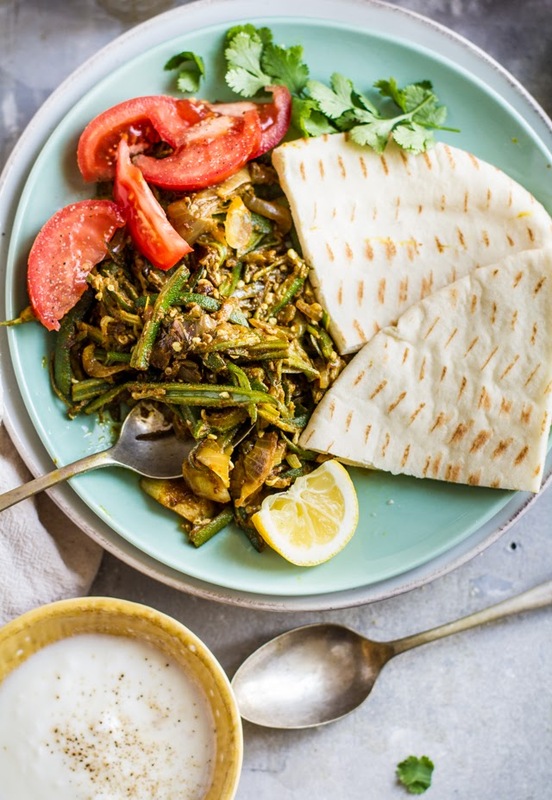 What a interesting way to prepare okra, love the spices you used. Your mother sounds wonderful, love recipes with stories. how lovely. I envy our mothers for being so young still :) I've had my son so late in life, I really regret it. Although, my mother would say I don't understand the challenges of being a young mother. 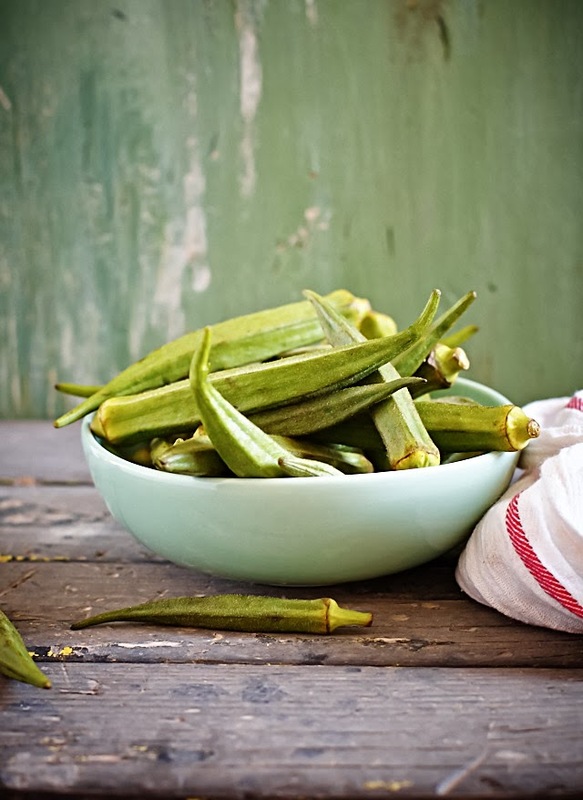 I've been on an okra binge lately.. a vegetable I never ate growing up has become one of my favorites and I'm always looking for new recipes to make it. Even my Ammi cuts lady's finger (as she calls it) the exact same way. She learnt the trick from a local magazine and I picked it up from her. Lovely post about your mother. What all mothers do to raise children and have their tummies full always. :-) Thanks for the links to those blogs. Enjoyed reading their pieces as well. Your mother sounds beautiful. How about having her in one of your shoots along with something delicious she has cooked? My favourite vegetable, unfortunately not easy to get by in The Netherlands. But I will try this recipe as soon as I can get some good okra! I think we are at it again. Cooking the same things :). I also add tomatoes to bhindi at times and it turns out great, as you said. I love the way you've written about your mother, it's so touching and makes me want to hug my mom. This is so beautiful.You are a wonderful writer Kulsum! Your mother sounds like a big inspiration in your life. My mother was already 30 when she had me so I have little memory of her as a very young woman, though I love looking at old photographs! As for okra, I've never liked it but I think I must try your stir fry version. I reattempted it last week actually (after avoiding the vegetable for a long time!) but still found it slimy! I think I've been cooking it wrongly.